Mass adoption of driverless cars is still years away, but architects, developers and planners already are designing new projects with autonomous vehicles in mind. Developers are starting to build offices with internal parking structures that can be converted to office space if demand for private parking decreases. New master-planned projects in cities like Toronto, Los Angeles, Oslo, San Francisco and Boston are being designed with features like curbside drop-off areas for passengers and e-commerce deliveries that replace traditional parking lanes. “The term that we’re hearing over and over again is ‘future-proof,’” said Jeffrey Shumaker, director of Urban Planning and Design at architecture firm Kohn Pedersen Fox Associates in New York. Novel ideas are being floated for the distant future as well as the messy transitional years until mass adoption of driverless vehicles is complete. For example, Gensler already is looking at ways to free up green space in housing developments by replacing driveways with common storage areas for autonomous vehicles. Meanwhile, a Reebok and Gensler venture has been studying how to repurpose gasoline stations in the future when driverless vehicles will visit remote charging stations instead. One idea: fitness centers that include playgrounds, workout areas and fresh food stores. “Today on your way home, you stop at the gas station to fill up,” said Joseph Brancato, a Gensler regional managing principal. In the future, the Reebok venture envisions transforming the properties into stations for “recharging human beings” where you “get an additional workout, buy some farm-to-table food and maybe pick up some holistic medicine,” he said. Real-estate developers and architects are thinking about a driverless future today because many of the structures and streets they’re designing will still be around decades from now. They see the benefit of including enough flexibility into today’s projects so that they can later adapt to changing transportation patterns with limited cost. Much of the future-proofing underway involves master-planned communities with new approaches to streets, bike lanes and other infrastructure. For example, Kohn Pedersen is designing a complex in Shenzhen in China with an elevated loop that could be dedicated to autonomous vehicles and underground parking areas that could be converted into retail space or other uses. Planners also are studying flexible streetscapes and parking guidelines for Boston’s Seaport development and for Sidewalk Toronto, a joint effort by the government and Alphabet Inc.’s Sidewalk Labs focusing on about 800 acres on Toronto’s eastern waterfront. The San Francisco Giants baseball team is looking down the driverless road with architecture firm Perkins + Will in their planning for Mission Rock, a 27-acre project south of AT&T Park. Planners are designing streets and buildings that can adapt to declining parking demand and the growing need for better curbside pickups and drop-offs of passengers and packages. Apartment buildings are being designed with more space—including cold storage—for package deliveries from Amazon.com and other e-commerce businesses. “These projects are beta-testing the autonomous future,” said Gerry Tierney, co-director of Perkins + Will’s mobility research lab. 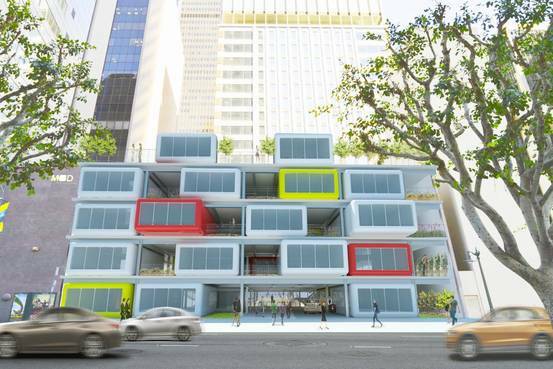 Parking garages that can be converted into other uses already are being built. For example, Gensler designed the new Cincinnati headquarters building for data analytics firm 84.51° with three floors of above-ground parking that can be converted into office space. That’s possible partly because the parking-floor heights are higher than those in typical garages. Also the facades of the parking floors resemble the rest of the 841,000-square-foot building. Gensler is exploring ways to convert stand-alone parking-garage structures into apartment buildings that could be used for student or other forms of low-cost housing. This could be done with modular units designed to slide into the structure easily, Mr. Brancato said. The backs of these structures might be designed so they could open up to the outside to bring in natural light, he said. “Parking garages are big and deep, and with residential you want as much natural light as you can get,” he said. Expense is a major obstacle to convertible parking structures. Whether they’re stand-alone or part of a building, they cost more to build than conventional garages. Because their ceiling heights need to be higher, convertible garages contain fewer spaces, making the idea a nonstarter with many developers. Long term, though, parking conversion can pay off, Mr. Brancato said. For example, he said Gensler is studying one convertible project in Denver’s trendy RiNo district that would initially include 117 spaces per floor, about 17 per floor fewer than if it were built using a conventional design. But if it is eventually converted into office space, the return on investment would be more than 40%, compared with 18%, he said. There’s also a danger in designing buildings without taking into account the approach of the driverless future, Mr. Brancato added.